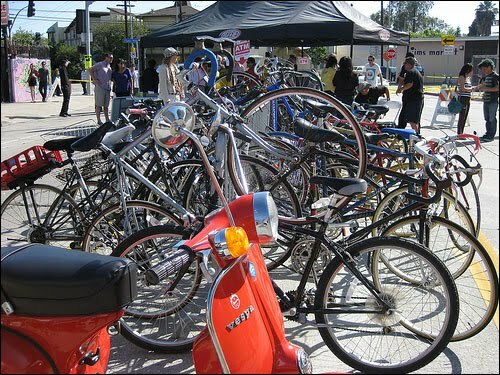 The progressive neighborhoods of Silver Lake and Los Feliz are naturally leading the green revolution in Los Angeles. I had a chance to experience this movement first-hand this past Saturday as I biked from my apartment in the Miracle Mile across town to the Silver Lake Jubilee -- a music and arts festival that is somewhat of a precursor to the larger Sunset Junction Street Fair. After parking my bicycle with the many other bikes at the huge bike rack at the entrance, I checked out the bands that were playing on two stages set up on either side of Myra Ave., which was closed off to traffic for the event. One common complaint I overheard was the lack of parking spaces. I wanted to tell them that there was plenty of bicycle parking but I kept it to myself. 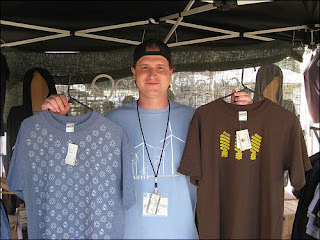 There were lots of vendors, including a clothing company called Green Getup Enterprises. "We're a 100% organic apparel company," said founder Joseph Epstein. "We use water-based inks and all our cotton is raised without pesticides. We also use recycled t-shirts and we're here today promoting the whole green movement." 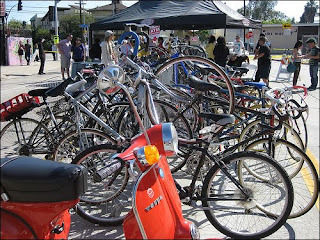 There was an Eco Village at the event where groups such as Farm Feliz, Sustain L.A. and Sustainable Silver Lake were educating people about proper gardening techniques and reducing waste. Speaking of, the Jubilee was officially designated as a Waste Zero event, meaning all the vendors were assessed beforehand to figure out their waste impact. 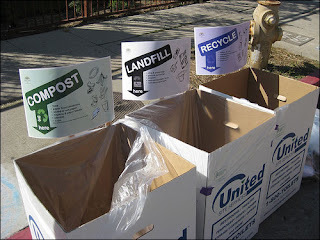 There were recycling and composting options in addition to disposing items in the "landfill" bin, which is the word they used instead of trash. There was also a weighing station to determine how many pounds of recyling, composting and landfill items there were. When I checked the scale it was at 70% composting, 20% recycling and the rest trash. 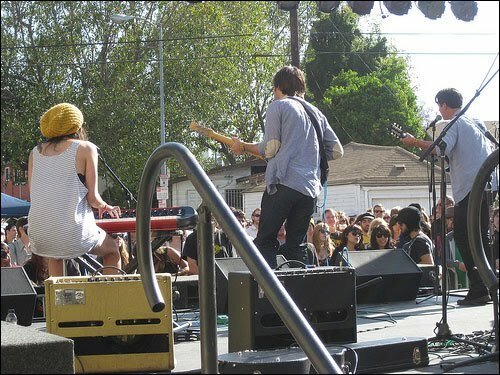 All in all it was a perfect Southern California day and evening with a positive, laid-back vibe and great music, food and environmental values.